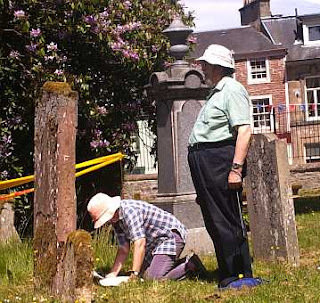 This last weekend, 19th and 20th June, a group of volunteers from the Society were recording the gravestone inscriptions at Jedburgh Abbey, Roxburghshire. In 1118, the Earl of Huntingdon, later king David I of Scotland, with the help of the Bishop of Glasgow founded a priory for Augustinian monks from Beauvais in northern France and elevated it in 1152 to the status of an abbey. The abbey is a superb example of Romanesque architecture in Scotland, and is thought to have taken about 120 years to build. 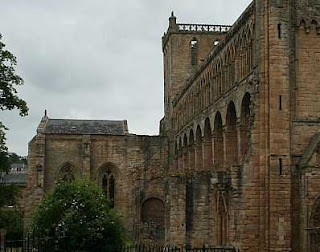 The abbey and Jedburgh were frequently damaged in wars and skirmishes with the English. In 1416, 1464, and 1523, the town and abbey were damaged and / or burnt by the English, and it was burned in 1523 and ruined again in 1544, and in 1548, French troops occupied the town. The abbey was suppressed in 1559 and eventually purchased in 1637 by the third Earl of Lothian. A new parish church was built into the west part of the nave of the abbey from about 1671 and used until 1875 when a new parish church was erected a short distance away. We've had groups recording gravestones before at Minto, near Denholm, Roxburghshire and at Duns, Berwickshire, and earlier this year, Stobo, Peeblesshire. We see these days as both an enjoyable day out for members and family, and as a training event for volunteers new to recording gravestones. In spite of some "call offs", there were 13 of us working from 10am to 3.30 pm on Saturday, and 8 on Sunday from 1pm to 4.00 pm. Including the gravestones in the abbey, there are about 400 gravestones in total. Saturday morning was unusually cold and windy for a June day, but the afternoon was much warmer. Sunday was a lovely warm sunny day, which proved slightly difficult for those trying to read faded inscriptions. Checking inscriptions on the gravestones that Norma and I tackled on Sunday was hard work, and we managed only about 12 stones in about two and a half hours. There's still a lot of work to be done, but at least we've made a start. The picture shows Morag and Ian Carter hard at work on one of the gravestones. Our thanks to Historic Scotland for providing free entry for us to do the work. When England play, you don't pay at www.findmypast.co.uk ! There's a wonderful offer for those of you trying to avoid the World Cup over the next four weeks – www.findmypast.co.uk is offering free access to almost all of their records every time England are playing. That includes census records up to 1911, births, baptisms, marriages, deaths and burials, the Chelsea Pensioner collection - all for England and Wales only. If, like me, you've been dreading the prospect of hours of football this summer, you now have the chance to use the time to take your family tree further thanks to this offer. For 90 minutes on each day that England play in the competition, the website will be providing free access to its extensive collection of records. To take advantage of the offer you need to make sure you are registered on the website no later than midnight the day before the match (don't register again if you have done so already). On the day of the match, your free trial will last for 90 minutes from the moment you log on, so you could even watch the match as well. You can log on anytime between 9am on the day of the match and 9am the following day. There's also the chance to win a year's full membership during each England game. but let's hope that England get through to the final, to give us even more time to search for free. The Friends of Berwick and District Museum and Archives have organised a series of talks to celebrate the 30th anniversary of Berwick Record Office. The first talk will be given by Linda Bankier, Archivist at Berwick Record Office, on 'Snippets from the Archives'. Linda will be sharing with us a miscellany of gleanings from the archives covering crime and punishment, local celebrations and customs from throughout the borough. Prepare to be enthralled, fascinated or even appalled! Friday 25 June 2010 - 7.30pm at Berwick Parish Centre, Berwick-upon-Tweed, TD15 1DF, England. Map. It's next to Holy Trinity Church. Entrance is through the churchyard. The suggested car parking is near the Barracks and Wallace Green. The project to catalogue and index the records at Robert Smail & Sons in Innerleithen, Peeblesshire, reached a significant milestone today. Robert Smail & Sons were jobbing printers in Innerleithen High Street. It was a family business which lasted for 120 years and provided for three generations of Smails. Smail & Sons were both hoarders and arch exponents of the adage “If it ain’t broke don’t fix it” and this is what distinguished them from hundreds of similar small businesses. As a consequence when the business closed the property including all the equipment and records was acquired by the National Trust for Scotland. Robert Smail and Sons is open to the public and still operates as a jobbing printer. With the property came over 100 years of business records. The most significant of these are the Guard Books – giant scrapbooks into which a copy everything printed was stuck - an amazing record of the work that the firm did. In addition to business records there is some private correspondence and a collection of photographs taken in and around Innerleithen at the beginning of the 20th century. 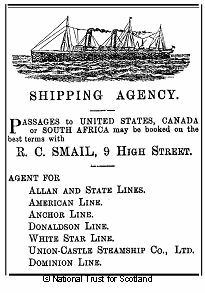 As a sideline Robert C Smail was an agent for a number of shipping lines selling tickets (including Allan and State Lines, the American Line, Anchor Line, Dominion Line, Donaldson Line, Union-Castle Steamship Co, White Star Line) to local people who wanted to travel. This agency ran for over thirty years from the late 1890s to the 1930s. The ticket books, ledgers and correspondence formed a quite distinct sub-set of the archive. There is a lot of interesting and valuable information in the documents which just might enable you to explain the disappearance of a relative or confirm where one of your ancestors came from. We’ve now got to the stage where this material has been indexed and today it became available on the Web. Go to Smail’s Archive and you can search the archive for yourself – better still there’s no charge. Typically you should be able to find out when some one sailed, their point of departure and arrival, the name of the ship they sailed on. There may other information about fares and onward travel as well. The results of the search can be printed out as a facsimile of a ticket. Whilst not to everyone’s taste the ticket includes some of the standard terms and conditions for travel. Including an interesting insight into the sort of food steerage class passengers would receive. Anyone for tripe or Irish stew at breakfast time ? The hearts of Teries everywhere will be in Hawick this week as the annual Common Riding takes place. The ride-outs are over for another year, the town is bedecked in blue and yellow and the Horse has been washed once more. Everything is in place for the climax to this year’s festivities. The excitement builds all week as the Cornet carries the Banner Blue for the first time at the Thursday morning chase. Young and old make their way to the Nipknowes for 6 am to see the flag once again being proudly held aloft. After partaking of curds and whey in the Hut, the Cornet and his followers return to Hawick to display the flag at Hawick Town Hall. Then it’s off round the schools to experience enthusiastic welcomes from the young of Hawick. Thursday evening sees the Colour Bussing ceremony when the Cornet’s Lass once again busses the flag. The Cornet leads his supporters on the walk to the Horse monument where ribbons are tied onto the horse’s neck to the loud cheers of the many townsfolk gathered to watch this event. The Friday morning procession cannot fail to stir the emotions of the assembled spectators as the Cornet and his followers ride along Hawick High Street to the sound of the fifes and drums and the Saxhorn Band on their way up to the Mair. Of the many poignant ceremonies which take place during the Common Riding, two cannot fail to impress - dipping the flag at the Coble Pool on the Friday afternoon and the laying of the wreaths at the War Memorial on the Saturday morning. These are only some of the events which Teries everywhere will recognise. The National Archives of Scotland have just announced changes to their service. Like the rest of the public sector, they are expecting budget reductions from 2011. They currently have 3 search rooms: a legal search room and a historical search room (the one where you can almost feel the history seeping into the air), both at General Register House, and one at the other end of George St at West Register House. From early next year they're intending to centralise access to historical documents in a single search room at General Register House, because most legal searches will be carried out through the Registers Direct service operated by Registers of Scotland, and they'll cater for the remaining legal searches in General Register House. They've also announced improvements to the online catalogue to show which records need to be ordered in advance - hooray ! One of the most frustrating aspects of the catalogue I find is that it does not say where records are held. On countless occasions I've arrived, tried to order records, only to find they need to be ordered in advance. Since I can never spare the time for 2 consecutive days in Edinburgh (let alone the expense of an extra return journey), that will be a big advantage. However, it would be a much bigger improvement if we can order records held elsewhere online, because at the moment, the only way I've found to do this is to send them an email - and they state that you need to give 48 hours notice. In practice, it's sometimes quicker, and sometimes not, especially if they have queries or there is restricted access to the records. They also say they will make greater use of digitisation to allow access to records at West Register House and in Thomas Thomson House. Researchers at West Register House can use a digital camera (no flash, tripods or moving images allowed) to photograph the records at the reading desk, or at a dedicated camera stand equipped with lights, as long as there are no restrictions on copying the records. This is a trial, but they're hoping that this will be a capability in the new consolidated search room. They want to hear your views, and in particular, which records should be stored close to the proposed new single search room at General Register House ? Which records should they digitise next?